Wondering if content marketing will help move the needle? 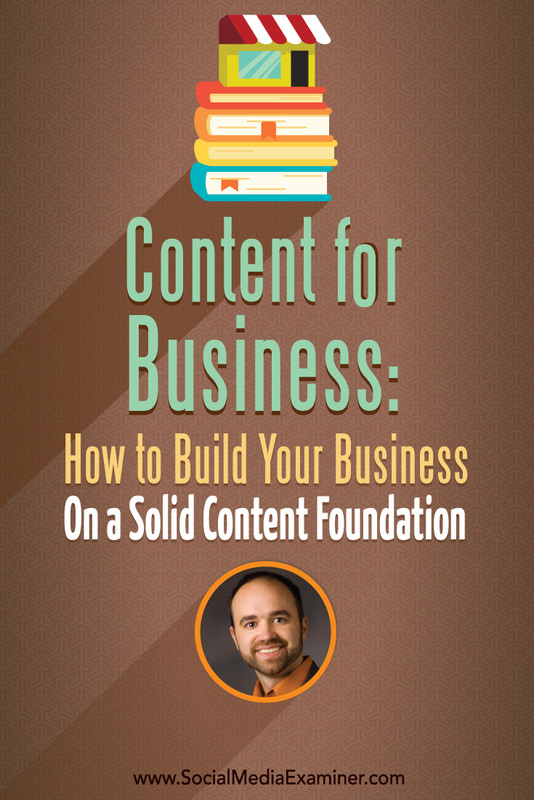 To discover what it takes to build a content-driven business, I interview Joe Pulizzi. In this episode I interview Joe Pulizzi, founder of the Content Marketing Institute, author of the book Epic Content Marketing and the founder of Content Marketing World, the leading conference for content marketers. 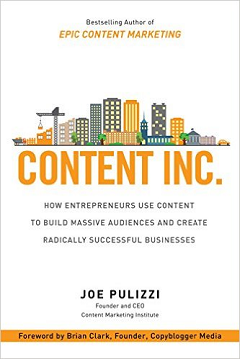 Joe’s latest book is Content Inc.: How Entrepreneurs Use Content to Build Massive Audiences and Create Radically Successful Businesses. 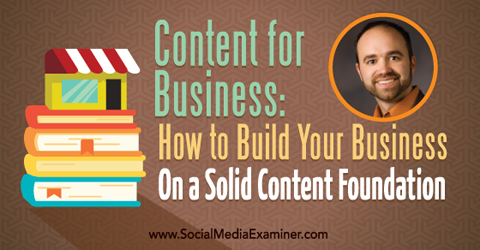 Joe will explore how you can build a sustainable small business with smart content marketing. You’ll discover the six steps to take to create a content business in any niche. Listen as Joe Pulizzi shares what marketers need to know about using content marketing for business. Joe shares how he got into the content marketing industry. He was vice president of custom media (also known as content marketing) at business publishing company Penton Media until 2007. At Penton, Joe and his team helped advertisers who wanted to do something unique tell their stories. For example, if a company like Microsoft wanted to tell a story to an executive audience, Joe and his team would help them create an ongoing newsletter, a magazine, blog series or webinar series. Joe did that for seven years. 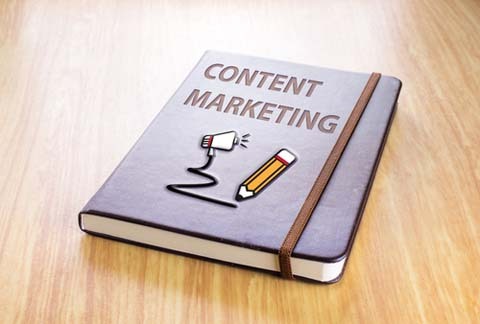 Joe left Penton at the end of March 2007 and wrote his first blog post titled “Why Content Marketing?” on April 26, 2007. That led up to Joe launching Junta42, which he says was basically the eHarmony for content marketing. The idea was to match brand sites that wanted to outsource some portion of the content process (creation or distribution) with agencies that would pay for the service to get the leads. Image caption text. Image: Shutterstock. Joe explains how in 2008, with no money, no paid distribution and about 2,000 subscribers, he decided it was time to build relationships with influencers. He started a research project called The Top 100 Content Marketing Blogs. (I was on the list first for White Papers and then Social Media Examiner.) He notified everybody who was on the list, and it just took off. Fast-forward to 2009, Joe shares, the model was working and they matched up about 1,000 projects. However, they were still having trouble getting companies to pay for a subscription to the service, even though they were driving leads to them. After his best case study (they sent a $1 million+ customer to an agency, and the agency decided not to renew their subscription), it finally hit Joe that this business was not going to work. Although Joe was “in love with his product,” he finally figured out the key was to fall in love with your audience and focus on their needs and pain points. His audience was asking for training, education, consulting and speaking. They weren’t even ready for a matching service, because they didn’t even know how to create a content marketing strategy. Joe pivoted to the education and training concept and launched Content Marketing Institute six months later. That was May 2010. Joe created the Content Marketing Institute in May 2010. Listen to the show to hear how Joe and I first connected, as well as the similarities between our projects. Content Inc. is Joe’s fourth book. The other three are content marketing–related and focus on enterprise marketers in larger companies. This book tells his story and the stories of others who are growing their content marketing business. Although the time tables are different, all of the entrepreneurs interviewed followed the same six steps to get their business going. If you’re going to start a business today, this is absolutely the best way to do it, Joe believes. Focusing on a product first, like Joe did, is the wrong way to do it. The best way to do it is build an audience. Once you build an audience, you can monetize it. For example, if you have a stock portfolio and put all your money into one stock, that’s really risky. Diversification is the key. It’s a lot easier to build a long-term audience and then monetize it in multiple ways. Joe wanted to prove the model works in baking, consumer, business to business, manufacturing, etc. The case studies in the book, researched through in-depth interviews with entrepreneurs who were focused on becoming the leading information provider in their niche, consistently deliver on that promise. There was an average of 15 to 17 months to monetization. If you want results tomorrow, this is not your model. But if you want to build a long-term business that can grow faster than other businesses once it gets to a certain level, this is for you. Listen to the show to discover why this concept works even in an oversaturated industry. Joe shares examples from the book. Matthew Patrick of Game Theory has over 4 million YouTube subscribers. In his Game Theory videos, Matthew uses graphics and voiceover to go in-depth about quirky things on video games, like Legend of Zelda or Minecraft. Matthew, who is in his mid-20s, started Game Theory because he wanted to be an actor and thought the YouTube channel might lead to work. He combined his passion for video games and knowledge of analytics to create his business. To rise above the clutter in this niche, Matthew took a different angle. He didn’t just talk about video games, he covered the backstory and the different theories about why programmers do certain things. He built 500,000 subscribers in a year. Ann Reardon, the baking queen of Sydney, Australia, has a similar story. She started her company because she had extra time on her hands and was very passionate about food. But since there are thousands of baking blogs out there, she needed a content tilt. Ann’s area of differentiation is that she does impossible food creations. She got more than a million subscribers in the first three years. Matthew monetizes his business in several different ways: through YouTube advertising, consulting and merchandising. He’s got 15 or 20 people working for him and he’s growing his business like crazy. If anyone is looking for the expert on getting more traffic and eyeballs on YouTube, it’s Matthew. And it has nothing really to do with the platform he built. The other key, Joe says, is multiple revenue sources. 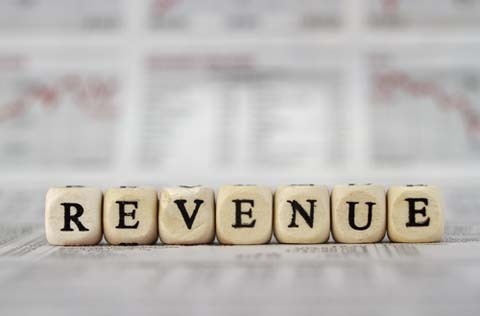 For example, every month John Lee Dumas of Entrepreneur on Fire shares his revenue report on his podcast. John makes money off of his podcast platform in about 12 different ways. In addition to advertising on his podcast, he offers all sorts of training on how to become a podcaster. Listen to the show to learn why everyone’s minimum viable audience is different. Joe gives Brian Clark of Copyblogger Media, as well as Social Media Examiner and his own Content Marketing Institute, as examples of content businesses on the blogging platform. In this model you build email subscribers and the audience. After you find your sweet spot and the content tilt (that area of differentiation), the third step is to build the base: consistently publishing to one platform over time. On Copyblogger, Brian Clark published every day for 19 months. He built over 200,000 subscribers and now has an over $10 million company. He doesn’t even sell advertising. He sells software as a service. Most people drop off after building the base, Joe explains. They don’t have the patience to wait. If your timetable is less than a year, it’s going to be tough. Generally in all the cases studied, it took over a year to really get going. Listen to the show to learn more about how Brian built his business. Joe shares the six steps in his content model that came out of his research. 1. Sweet spot. In most cases the sweet spot is a mixture of someone’s passion and something they have an innate knowledge about. For example, Andy Schneider is The Chicken Whisperer, the world’s leading expert on backyard poultry. Andy found a content gap for people who live in the suburbs and want to raise chickens in their backyard, but didn’t know how to do it. Andy combined his passion for teaching with his knowledge about backyard poultry. He started doing meetups, which he parlayed into a podcast. That parlayed into a book, which parlayed into a magazine and so on. 2. Content tilt. The content tilt is the difference in the story you’re telling. Ann Reardon was big into teaching, and as a qualified dietitian food scientist, she had the knowledge. She focused her content tilt on impossible food creations, such as this Instagram cake. 3. Build the base. After someone finds their niche, they need to decide on a platform, whether it’s a blog, podcast or video, and then publish consistently over a significant amount of time. That’s how to build the base. 4. Harvesting audience. To harvest audience, get subscribers. Everyone needs email subscribers. However, depending on your platform, you may want to get YouTube or iTunes subscribers, as well. 5. Diversification. After you build the platform and harvest the audience, then it’s time to diversify. ESPN, for instance, took a long time to build. They started as a cable network. Today they are a magazine, an awards program, they’ve got podcasts, a radio network, everything. Resist diversifying too quickly, until you have an audience that can handle it. 6. Monetize. Once you go through the pain of the first five steps, then you can monetize. There are an average of five to seven ways each of these platforms monetizes itself. You just have to create a loyal audience before you can ask people for money. 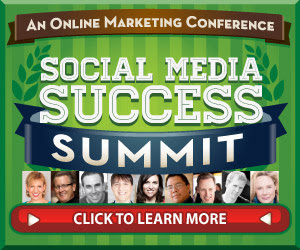 Listen to the show to hear how Social Media Examiner monetizes. 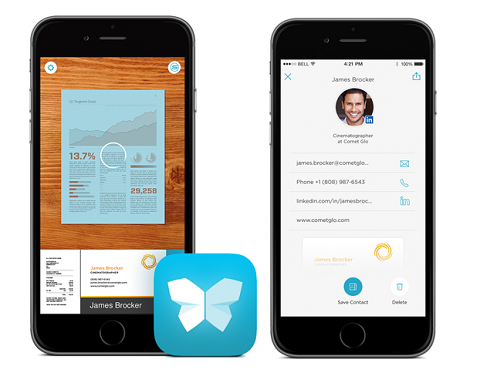 Evernote has an awesome new app called Scannable by Evernote. It’s a free app that’s only available for iOS right now. Pull up the app, hover the camera over anything, such as a piece of paper or a business card, and it automatically scans and crops it. Scannable by Evernote automatically scans and crops anything you hold the camera over. If you don’t have a scanner and you need to take a nice picture of something, this is an easy way to do it. But there’s more. When you bring home a bunch of business cards after an event, open Scannable, hold it over a business card, and like magic it scans the business card without pushing any buttons. Afterward, it asks if you want to add the person as a contact. If your Evernote is connected with LinkedIn, it will pull in all of the data, create a contact and pull in any data from LinkedIn. You can even scan business cards while you’re at an event or trade show. Listen to the show to learn more and let us know how Scannable by Evernote works for you. Andrea Vahl says she always gets so much value out of the summit by listening to the recordings, listening live and live-tweeting. She will be presenting on the frugal person’s guide to Facebook ads and will dive into practical techniques to help you save money on your Facebook ad campaigns. She will share how to get cheaper clicks, how to do split testing and what techniques work best for different-sized businesses. Connect with Joe on his website and on Content-inc.com. Read Content Inc.: How Entrepreneurs Use Content to Build Massive Audiences and Create Radically Successful Businesses and Epic Content Marketing. Learn more about Content Marketing Institute and Content Marketing World, which is September 8-11, 2015. Listen to This Old Marketing podcast and Content Inc. podcast. Watch videos from Matthew Patrick of Game Theory and Ann Reardon’s impossible food creations. Learn more about John Lee Dumas Entrepreneur on Fire and Brian Clark’s Copyblogger Media, as well as Chicken Whisperer Andy Schneider and ESPN. Check out Scannable by Evernote. What do you think? What are your thoughts on content for your business? Please leave your comments below. Content marketing photo and Revenue photo from Shutterstock. 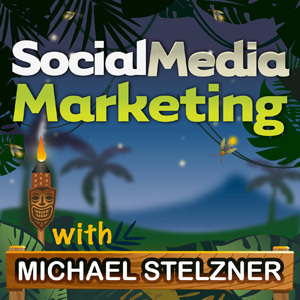 Joe Pulizzi talks with Michael Stelzner about how to use content marketing for business.